Young ones will love cruising down the cycle path on a little trike. With some help from Mum or Dad, they’ll be conquering the park and racing the big-kids in no time. 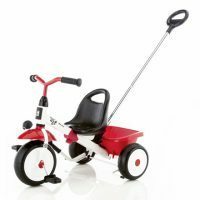 Trikes are a great way to help children and parents have fun together while spending time outdoors. Our tricycles are perfect for children age 2 and over. We know that you worry about the safety of your toddler. That’s why we designed our tricycles to include fantastic safety features like a limited steering radius to stop them straying too far off course, handlebar grips for comfort and control and a low centre of gravity to prevent topples. 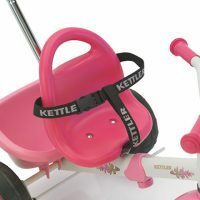 To keep your little ones extra safe and secure, we also offer easy-to-use, adjustable safety straps. Some models even include a handy parent pole – so Mum or Dad can do all the hard work, while the kids rest their legs. Watch as your child begins to learn to balance and practices the motions required for cycling. You’ll be amazed as they gain confidence and even independence. Happy Trike models have adjustable frames that are designed to grow with your child, so they can use the trike for as long as they need. When they’re ready, take the next step by graduating them to a balance bike. Before you know it, they’ll be speeding away on their own! At KETTLER, you’ll find trikes of all styles. 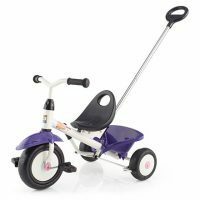 The funky purple Funtrike or the pink princess Happy Trike complete with decorative crowns bring a touch of glamour to the fun. 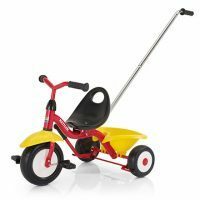 Racers may prefer pretending to zoom around the tracks on a super cool racing Happy Trike. 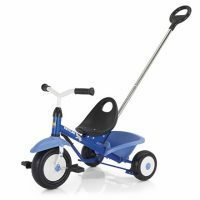 And we know all cool kids will enjoy the stylish all-blue Funtrike. Parents, don’t forget safety straps for extra protection!